In an uptown strip joint, a cop is found bludgeoned to death. The weapon's a baseball bat. The motive's a mystery. It's a case of serious overkill that pushes Eve Dallas straight into overdrive. Her investigation uncovers a private club that's more than a hot spot. Purgatory's a last chance for atonement where everyone is judged. Where your most intimate fate depends on your most intimate sins. And where one cop's hidden secrets are about to plunge innocent souls into vice-ridden damnation. Every now and then I read a comment on the "In Death" series where the reviewer has a negative comment on Susan Ericksen's narration. This baffles me. Ms. Ericksen IS Eve, Roarke, Peabody, etc. I would NEVER want another narrator for this series. I enjoy Nora Roberts/J D Robb's writing and I love Ms. Ericksen's narration. Please, don't listen to the negative comments. Listen to one of the books and make the decision yourself. I don't think you will regret it. I can't imagine anyone else reading the In Death books. Susan Ericksen is great, in my opinion and, after what seems like tons of books in the series she IS the voice of Dallas, Roarke, Peabody (my favorite), the commander and everyone else. The stories are so entertaining and fun to listen to, I wish J.D. Robb could write more of them. When she writes as Nora Roberts, the books don't send me but this series is one of my very favorites. 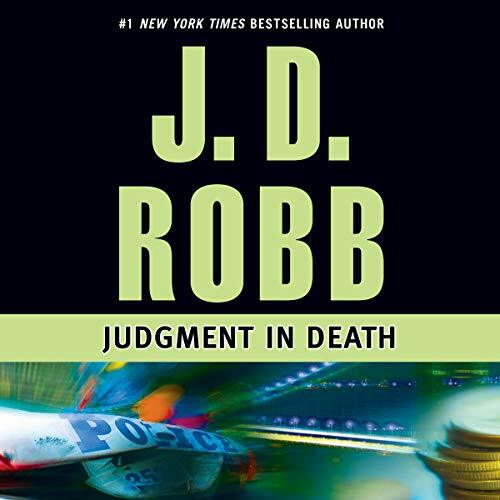 I just discovered JD Robb's "In Death" series of books not long ago. I'm in book hog heaven! I started with book one and am working my way up the list. As soon as I finish one I move on to the next. I love the characters. A good plot will fall flat if you don't like the main characters. All of Robb's characters are fleshed out, warts and all. Susan Ericksen is irreplaceable as the narrator. She does an excellent job. I highly recommend all of the "In Death" books for a great whodunnit escape in fantasy. EXCELLENT WRITER AND EXCEPTIONAL NARRATOR! The plot is as good as ever. Susan Erikson's performance on the different characters were excellent. I love the voice for Rourke with his Irish accent. Eve Dallas as usual got her man. I like how the crime is solved. I am still catching up with the few books in the series that I have not bought yet. I enjoyed the series so far and will continue to follow up. Beware!! Segments may cause pants-peeing!! I am at a loss to come up with enough superlatives for J.D. Robb (author) and Susan Ericksen (narrator)!! There are "scenes" in this one that I played for friends, out of context, because they are so PERFECTLY staged. I would point out that that alone should tell you a LOT!! You can't HAVE such scenes if you are not thoroughly engrossed in the story and have a big investment in the characters!! Great story line with relationship stress. Different to hear Roarks possessiveness come out and their egos go to battle. I love the way they work through problems no matter what comes their way. And the interdepartmental stress has Eve showing her colors throughout the story. Love watching Peabody come into her own, but Dallas and Roark in this book are the best yet. Their dynamic personalities struggle, tangle and resolve beautifully! loved it! I couldn't stop listening to it! I love the banter between the characters and the dynamics of Eve and Roarkes relationship. This is a very emotional story of Eve investigating murder and corruption in the NYPSD. Add in Richter, an evil old nemesis of Roarke’s, and the two of them are challenged on multiple overlapping levels. Ericksen does a very good job of narration. What made the experience of listening to Judgment in Death the most enjoyable? I would but only if they had read or listened to the previous ones. This wasn't my favourite In Death book just because a Eve and Roarke spend most of the book in a fight which disturbs me. I think it was necessary for the plot and development but I like them to be close so that's why it wasn't my favourite but still a good story. Never had an in death book I haven't enjoyed. I have never had an In Death book that I haven't enjoyed an this was no different. Cops are dying the murderer another cop or a bad mans flunky only Lt Eve Dallas and her team can bring the murderer to justice.